PostRank had been acquired by Google in June 2011 and shut down in May 2012. Few months ago I’ve covered AideRSS service that analyzes RSS feeds and assigns popularity indexes to posts, based on number of factors (comments, social bookmarks, etc). Since then service journeyed through closed beta in which I inactively (sorry) participated and re-emerged as new PostRank site. Functions are still exactly the same. 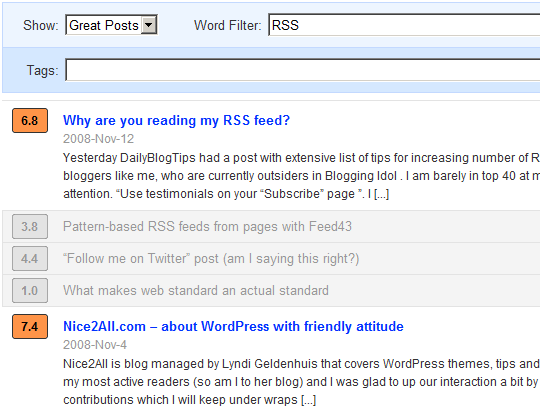 You input feed or site URL and get ranks for each post . If you had previously used AideRSS your feed is still being tracked. Otherwise you’ll only get results on recent posts and it will start tracking feed from this point. One of the reasons for moving focus away from the AideRSS name is that people tended to stumble over it — misspellings, problems remembering it accurately, and it didn’t seem to clearly communicate what we do. Whatever. Together with name change service lost its jumping bear mascot and got new (way more businesslike) site. I like new design but it lost plenty of static informative parts in favor of dynamics and on-hovers. New filtering and tagging functions increase degree of results customization in nice way. Service obviously moves in some direction but I am not sure I can understand that movement. I still like core idea a lot and still miss details and specifics of how ranks are calculated. On other hand I have a feeling that ranks became more precise and reliable which is most important feature here. I am not yet running around suggesting it to everyone (which I do with Skribit a lot :) ) but more good changes and I just might start to. « Why are you reading my RSS feed? Hi Rarst — Thanks for the write-up! Which static information items (that have been removed) are you referring to, exactly? I imagine the primary one is the PostRank metrics, which are now accessible via mouseover on PostRank scores. Any others? All the specific information about how we calculate rankings is still located here: http://postrank.com/postrank/. Regarding the engagement feature on the homepage, it’s something we’re experimenting with for now, and yeah, we’ve had the discussion that it’s not going to mean a whole lot to folks who aren’t really familiar with our system already. The goal is to integrate engagement analysis into more of what we do, so that will evolve over time. For info items – I think AideRSS had some kind of ranks graph and average number of posts. Don’t see those in new version. Yep, information is there and still bit vague for my taste. If I look at post in Google Analytics I can see how many pageviews it got, what amount of time people spent on it, had they bounced or moved deeper… In PostRank I see that it got few comments and is ranked 6 or something. GA are details without rank, PostRank is rank without details. Ahh, right the spark line and the posts stats at the top. Yeah, those are gone for now. However! I was talking to our designer, and he showed me some ideas he’s been mocking up, which would bring back more stats. Whether it will get integrated back into the Feed Details pages or result in the creation of stats pages… we don’t know yet. There’s also no ETA yet on when we’d work on that project, but like I said, we have mockups, and are collecting ideas and suggestions. These are obviously interesting to me as to blogger. But as reader I won’t use filtering technology if I am not sure how it works. It is slightly similar to antispam – you either have control and/or knowledge about filtering process or you don’t. I am not likely to rely on latter.